What notification options are available in Wealthbox CRM? 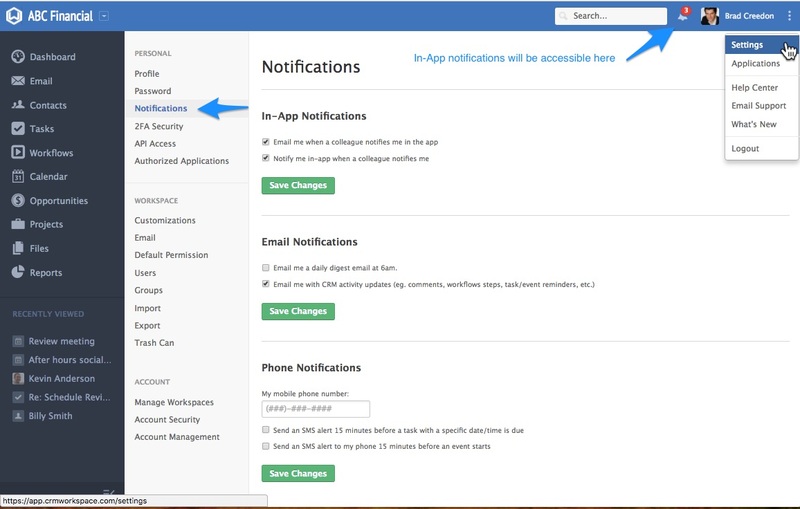 In Wealthbox CRM, there are various In-App, Email and Text Notifications you can enable. When a co-worker uses the “Notify” feature within notes or activities (i.e tasks and events), the select users will receive an in-app notification and or email depending on the checkboxes selected. Email me a daily digest email at 6am. – This option sends a summary of todays Tasks, Workflow Steps, Events, and Opportunities. See also: What is included in the Daily Digest email? Email me with CRM activity updates (eg. comments, workflows steps, task/event reminders, etc.). See also: If I choose to receive email notifications for CRM activity updates, what can I expect?